Hi there! It's so quiet here without my son (he's in school right now and the baby is napping). So it's a great time to update my blog! Since I'm hosting a CAS (clean & simple) Christmas card swap I thought I would make CAS Christmas card today. 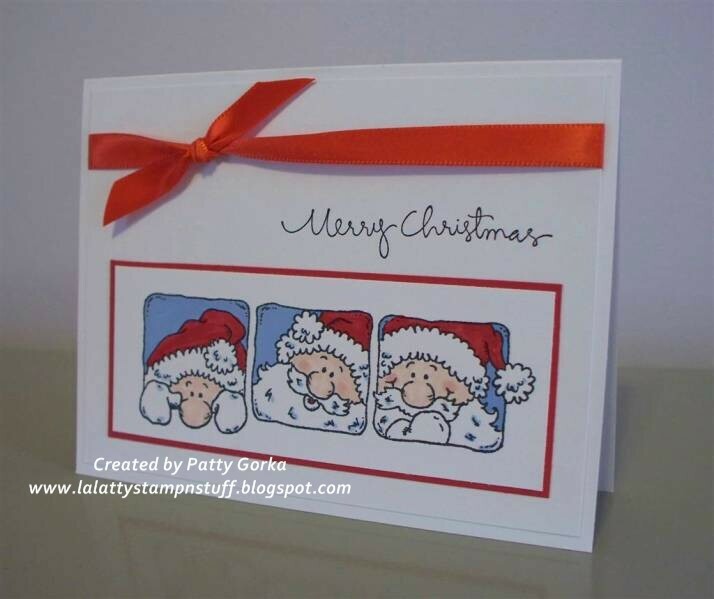 I received this image from one of my online stamping friends, thanks so much Jill! I simply colored in the image using my SU markers and then I layered it onto my real red card stock. Next, I added my silk red ribbon and then I stamped my Merry Christmas sentiment on my card. (I used my stamp-a-ma-jig to help me align it nicely). My ribbon is from Offray. This was such a quick card to make; I can easily see myself making a few more of these for my holiday cards! Thanks again for stopping on by and have a great rest of the day! Very cute, Patty. LOVE that clean and simple look too. This santa card is very cute. Whimsy too! CAS and oh so cute and fun! Oh, Patty, that's just TOO cute! I love this! Perfect CAS card. I love that image its the cutest!!! !